As I write this my daughter sleeps in her bed 700 miles away. My 10-year-old daughter, Iris, spends the school year living with her dad in Sun Valley, Idaho and the summers living with me in San Francisco. The story of how this arrangement came to be our “normal” is filled with tremendous grief and resilience. Iris’s dad and I divorced when she was 3 years old. We always had a difficult marriage and after our daughter came into the picture, our differences were too challenging to gloss over. I didn’t want Iris to grow up in a home loaded with conflict and sadness, so I decided to leave the marriage. We had lived in Sun Valley, Idaho, for many years and while I didn’t have family anywhere close by, I chose to remain there for Iris’s sake. I attempted to create my own identity in a small town where gossip is an Olympic sport and privacy is hard to come by. I began a new career in finance with a national firm and regained my confidence and independence as a single mother. My ex-husband and I really struggled to co-parent peacefully, often relying on a professional mediator to settle our disagreements. It was very painful for all of us and I became quite depressed, feeling hopeless and stuck in a pattern of conflict that was robbing me of the joy of motherhood. After a few years in my job, I was offered a promotion to my firm’s San Francisco office. The thought of moving to San Francisco (a city I had always adored), advancing my career, and starting over after a hostile divorce was too good to pass up. I approached Iris’s dad with an arrangement for her to move with me and come back to Sun Valley to visit often so he wouldn’t give up any of his custodial time, we’d just rearrange the schedule. Initially, he agreed, as I’d always been the primary caregiver and Iris lived with me the majority of the time. He suggested I move to S.F. for a few months to get settled and find an apartment, then he’d send Iris at the end of the school year. With this plan, I set forth to get us settled in a new job, new school, and new city. Not much time had passed before he changed his mind and decided he wanted Iris to stay with him in Idaho. I was completely over a barrel, my choices were to a.) give up my new career and go back to a town where I was locked in a toxic pattern of conflict or b.) stay in S.F. to continue on a healthier path… without my daughter. The following year was one of the darkest times in my life. We went through a series of agonizing custody proceedings to determine what would be best for Iris. 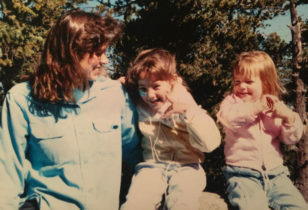 Even though I had always been the primary caregiver, the judge presumed our life in the city presented more risks than small-town living and that a working mother would be too distracted to adequately care for her child. The judge concluded that Iris should stay in Sun Valley for the school year and spend summers in San Francisco. He granted me monthly visits and holiday breaks during the school year. Iris and I were heartbroken. She was confused about why I’d moved away and she felt like I chose to leave her behind and put my job first. The circumstances were far too complicated to explain to a second grader. For me, the move wasn’t about career, it was about hitting the reset button on my life…for my emotional well-being, to be a whole person again. If I thought I would get ahead financially by taking a promotion in S.F., I was wrong. Every extra penny I earned went toward legal bills and flying back to see Iris. Yet still, my instinct was to stay in S.F. even though it was more onerous than I’d anticipated. I desperately wanted to be with Iris and make her life easier, I knew this decision would have a lasting effect on her and the separation was traumatic, but every ounce of my being was telling me to stay in California. Sun Valley wasn’t a healthy place for me, the job opportunities were scarce, and the discord with my ex-husband had become too severe. 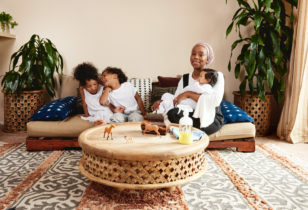 I had to reckon with the dichotomy between my values as a mother—that you always do what is best for your child—and the reality that what is best for the parent is also best for the child. I took responsibility for the mess we were in, the trauma of the separation was a path I chose, but Iris was the one who had it forced upon her. Flying on airplanes alone, spending long stretches of time away from one parent or the other. The transition from being a full-time parent to single woman in the city was gut-wrenching. While my new job was exciting and a new city inspiring, I was hollow inside. I cried on the bus, in the bathroom at work, at my desk, in Lyfts, on dates, at church, at the airport. My password for my login at work was 1amBrave! I typed it a hundred times a day. My family and close friends encouraged me to stay in S.F., they knew how lonely I was in my marriage and subsequent divorce in an remote mountain town. They encouraged me to revisit my definition of motherhood and embrace my needs in tandem with my daughter’s. 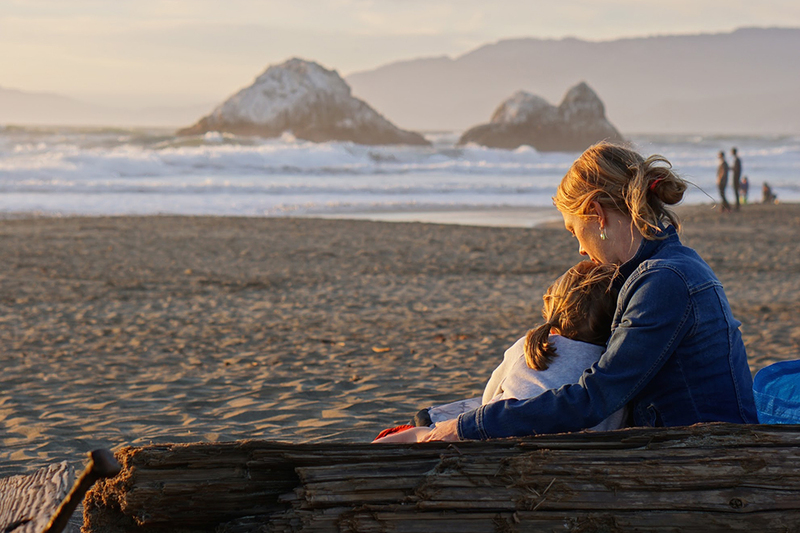 When motherhood is so entwined with every breath you take, where does the individual reside? As the months have passed and it’s been almost 3 years since we began this new arrangement, we have miraculously healed. When I’m most lonesome for my child, I visualize where she is in her day, what she may be doing—laughing, playing, reading, sleeping—this helps me feel as if I can almost hold her despite the distance. During our summers together we have incredible adventures exploring the city, kayaking among seals, riding bikes in Golden Gate Park, camping along the coast, and road trips to the beach. I treasure these memories and fiercely safeguard our time together. I’m a different mother because of the distance between us and I’m committed to being very involved in her life throughout the year. Today, I’m remarried to the most wonderful man. I’ve started my own financial planning practice in order to have more flexibility for Iris and create a service that’s in line with my values. My husband has been a gift and affirmation of this difficult journey, I wouldn’t have met him if I hadn’t stayed in San Francisco. His radical generosity has improved our lives ten-fold. We’re trying to start a family of our own now and struggling with infertility, which seems like a cruel joke after all this time. Motherhood has become an area of intense grief and intense joy. Iris and I will never be the same. I’m prepared for her to resent me when she’s older, she may feel like I made her life more complicated, but I’m hopeful that at some point she’ll understand how this came to pass and be emboldened on her own path as an independent woman. You seldom hear of mothers who don’t have primary custody after a divorce. It seems rare and for a long time I held a lot of shame around my decisions. I didn’t feel like I was a mother anymore, so much that I stopped reading this very website. I was afraid of being judged and viewed as a selfish woman who abandoned her child. I was surprised by the grace and generosity of so many people as I explained my circumstances. Many parents shared their stories of heartache and separation with me and I came to find acceptance for our unconventional mother/daughter arrangement. I’ve also learned I don’t have to defend this choice anymore. The court of public opinion holds no power over me. This path is for Iris and I to design and we don’t know exactly what it’s going to look like yet.